From their law office in Agoura Hills, California, the attorneys at DorenfeldLaw, Inc., serve a diverse range of clients throughout Los Angeles and Ventura counties and all the surrounding areas who need a competent, dependable legal ally in their corner as they face complex legal challenges affecting their lives, their livelihoods and their businesses. Personal injury claims arising from car accidents, slip-and-fall accidents and other acts of negligence. They also provide exceptional insurance defense services. Business law counsel to help you establish and plan your company the right way as well as assist with all aspects of your commercial transactions, contracts and other areas that affect your company. By delivering the personalized attention their clients deserve, the law firm's attorneys strive to develop long-lasting relationships with those they serve, and they have received numerous positive reviews and referrals from satisfied clients. No matter how complicated your situation or how complex your needs, you can trust them to help you find creative, effective solutions to your problems, and they promise to remain accessible throughout all legal proceedings to provide updates to your case while promptly addressing your questions and concerns. 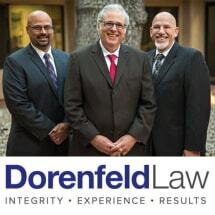 To find out more about how DorenfeldLaw, Inc., can best help you or your company attend to your important and pressing legal matter and increase your chances of obtaining the positive results you seek, you can contact their law office or visit their website to schedule a free initial consultation.